"What people like her do is creepy. They don’t even have to say anything. It’s intimidating just to have someone standing there." Quick, who's the longest-serving political prisoner in North America? In Canada, its a woman named Linda Gibbons. She's now been in prison longer than Karla Homolka, a woman who deliberately led three girls (including her own sister) to rapes, tortures, and murders in which she participated. 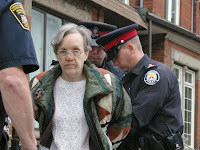 Her crime was praying, publicly, inside the 60-foot "bubble" around a Morgentaler abortion clinic in Toronto. She also, on occasion, held up a placard reading, "Why, Mom, when I have so much love to give?" She first did this in defiance of a temporary court injunction obtained by the Ontario attorney general back in 1994 and has returned to doing it, and been re-arrested, each time she has been released. She's in prison for violating political correctness statutes. By contrast, abortion doctor Henry Morgentaler, received the Order of Canada for his "commitment to increased health-care options for women." This is a pretty clear statement of the moral values of the Canadian government. Even if you support abortion, imprisoning someone for opposing something and awarding someone for supporting it is a pretty clear political statement of support beyond simple policy. Canada's charter technically protects free speech, but as the Human Rights Commissions and this event prove, that's not worth a whole lot. Freedom of speech means letting people say things you don't like to hear. Its the price of liberty. This temporary injunction law is an attempt to stop people involved with abortions from feeling as guilty about what they do and why. The law is still "temporary" 16 years later. Gibbons routinely leads women in prayer in the prison and has demanded more blankets for women sleeping in the cold prison cells, that troublemaker.